Enoki mushrooms are popular in Japanese cuisine. These little fungi look different depending on how they grow—in the wild, they are brown in colour, but when cultivated without light exposure, they become white. Prep: Wash and dry all produce. Cut off and discard the bottom inch of the mushrooms. Cut the green beans into 1-inch pieces. Mince or grate garlic. Peel and mince 1 tbsp ginger. Thinly slice the green onions. Make the sauce: Bring a small pot of salted water to a boil. 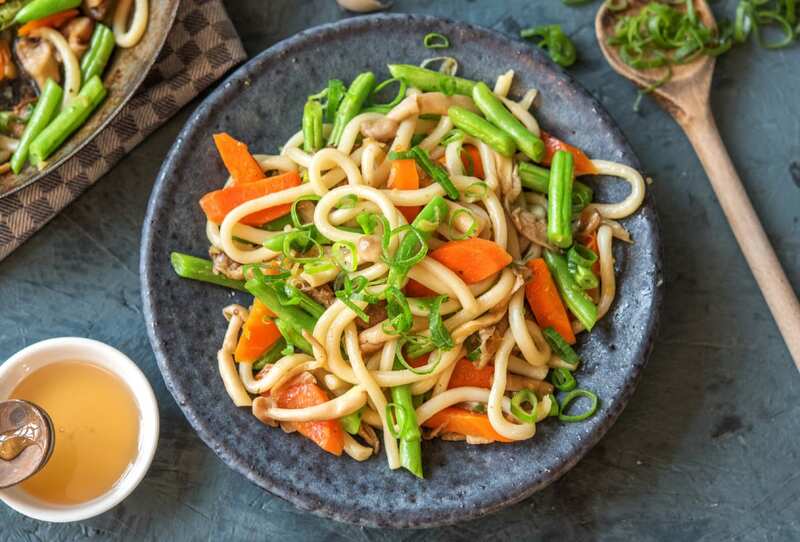 In a small bowl, whisk together the soy sauce, hoisin sauce, broth concentrate and 1/3 cup water. Set aside. Cook the veggies: Heat a large non-stick pan over medium-high heat. Add the sesame oil, then the green beans and carrots. Cook, stirring often, until veggies are tender, 6-7 min. Add the garlic, ginger and green onion. Cook, stirring, until fragrant, 1 min. Season with salt and pepper. Cook the noodles: Meanwhile, add the noodles to the boiling water. Cook, stirring, until noodles have separated, 1-2 min. Drain. Reduce the heat to medium heat. Add the sauce, mushrooms and noodles to the pan. Cook, stirring gently, until the mushrooms wilt, 1 min. 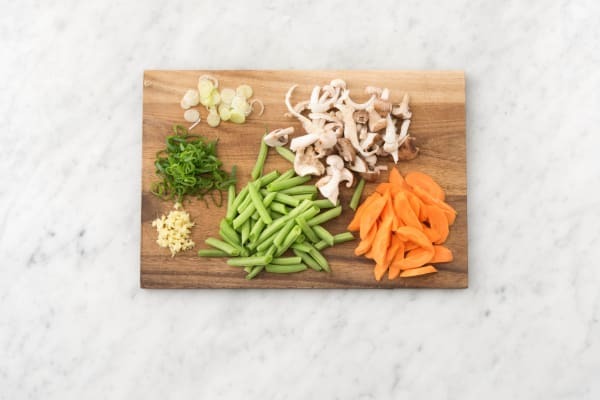 Finish and serve: Divide the stir-fry between bowls and enjoy!